Keeley Davidsen (left), ConnecTeen volunteer and winner of the 2015 YODA for Peer Support, with Jerilynn Daniels of RBC, the organization that sponsored the category. Keeley Davidsen’s experience with ConnecTeen began when she was going through her own issues and used our ConnecTeen services. When a high school project provided her with the opportunity to promote ConnecTeen she entered a video contest that included her fellow students. Keeley and her friends created a very compelling video called “U R Not Alone”. It was so well done the video was shown on the Jumbotron at the 2014 Calgary Hitmen Fan Appreciation night and ConnecTeen fundraiser. After receiving 39 hours of intensive training in crisis intervention Keeley began volunteering with Distress Centre in April 2014. A member of our staff Kaylee Knox, Contact Centre Volunteer Team Lead, nominated Keeley for the Youth of Distinction Award. Kaylee added that Keeley often goes the extra mile and picks up extra shifts when we need coverage on the lines. In 2014 she was the first to volunteer her time on Christmas Eve and also came in to support youth on Christmas Day. Keeley (right), with Kaylee Knox, the Distress Centre employee who nominated her for the award. She also volunteers her time and talent outside of the lines, creating videos for us to use for donor stewardship and to showcase ConnecTeen’s services. 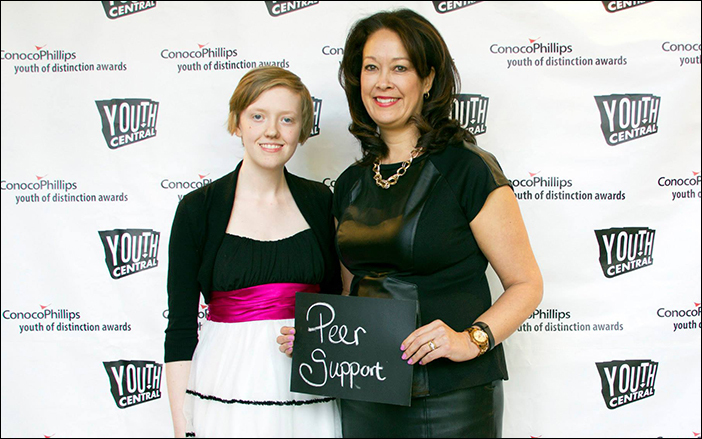 She updated the “U R Not Alone” video to be shown at our 2015 Calgary Hitmen-ConnecTeen fundraiser event. On May 2nd Keeley was announced the winner at a luncheon hosted by Youth Central at the Calgary Zoo. Jerilynn Daniels, Sr. Manager of Community Investment & Marketing for RBC, presented the award. RBC is a valued Sponsor Distress Centre’s ConnecTeen program so we were happy to have RBC present the award. Distress Centre and ConnecTeen are incredibly fortunate to have volunteers like Keeley on our lines, providing supporting to youth in crisis. You can see her nomination video here. Learn more about our ConnecTeen program at CalgaryConnecTeen.com. Please consider volunteering with Distress Centreif you are 18+ or ConnecTeen if you are 15-20 years old.